In 1999, 13-year-old music prodigy Celeste survives a horrific school shooting. After singing at the memorial service, she finds herself launched into a successful singing career with the help of her songwriter sister and talent manager. Eighteen years later, the adult Celeste is now staging a comeback after a scandal almost derailed her. 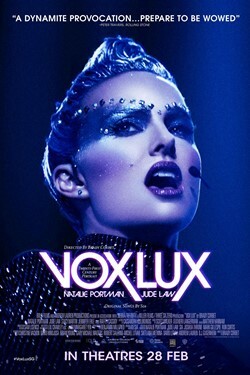 As she goes on her tour in support of her sixth album, "Vox Lux", she struggles to overcome the personal and familial issues she faces.